Ten of the 11 returning members of the Freedom Caucus in the Texas House have publicly backed the Angleton Republican as speaker. It was a Sunday night in the middle of August, and the Texas House Freedom Caucus had grown frustrated with state Rep. Dennis Bonnen. Bonnen, an Angleton Republican who had been tasked with shepherding the House’s property tax measure through the lower chamber, wanted to postpone a final vote on the bill until the next morning. State Rep. Matt Schaefer, a Tyler Republican and chairman of the Freedom Caucus, wanted to nudge the issue closer to Gov. Greg Abbott’s desk for a signature. Bonnen said he needed time to handle negotiations between the two chambers. “Can’t we walk and chew gum at the same time?” Schaefer asked Bonnen from the back microphone on the House floor. The chamber was tense, and members were tired. The Texas Legislature was burning through the final hours of the special legislative session trying to hammer out a compromise on Abbott’s No. 1 issue. That night, Bonnen won. And now, 15 months later, he seems poised to win again. Bonnen says he has the votes to succeed retiring House Speaker Joe Straus, whose more moderate Republican leadership drew the ire of the further right-leaning caucus in 2017. 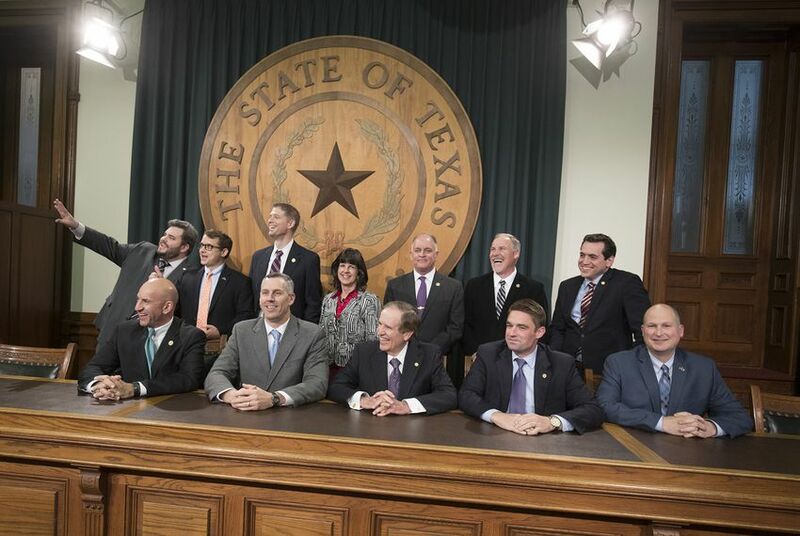 But Bonnen, long considered a top ally of Straus, has earned the blessing of all but one of the 11 returning caucus members in his bid to become the next leader of the lower chamber. Will the group, along with a number of closely aligned outside coalitions critical of Straus, take a less combative approach during the 2019 legislative session? Some caucus members say they think so — and with that tense night in 2017 now a thing of the past, signs suggest that many hardline conservatives are optimistic for the new leadership Bonnen could usher into the chamber. Bonnen checks off some obvious boxes on their lists: He ranks center-right among Republicans, he is politically savvy and, perhaps most importantly, he has a record of dogged independence over his 20-plus-year tenure in the House. Those traits could translate into striking what some caucus members say would be the perfect balance: Standing up to the more conservative Texas Senate when needed, while also fostering relationships with Abbott and Lt. Gov. Dan Patrick, the Republican who presides over the upper chamber. The Freedom Caucus launched at the start of the 2017 legislative session to push a range of conservative issues, such as anti-abortion measures, private school subsidies and pro-gun legislation. The group was effectively a thorn in the side of House leadership. One of its most notable moves was a parliamentary tactic known as the “Mother’s Day Massacre,” which killed more than 100 bills and highlighted long-running tensions among House Republicans. In 2019 though, at least one caucus member is suggesting the group could play a different role. For state Rep. Matt Krause of Fort Worth, a caucus member backing Bonnen, a new leader could prompt the group to take on a strategy that’s “much more congenial and constructive than adversarial” in 2019. To Leach’s point, Bonnen has moved to cast himself as a leader who wants every House member to participate in the legislative process. “All 149 members are going to be part of this House,” Bonnen said at the press conference. "Whether their name is on the list today or not is unimportant." A day later, Bonnen appointed a bipartisan working group to identify candidates for House parliamentarian — which includes a Democrat who declined to endorse Bonnen for the job. Though all signs point to Bonnen succeeding Straus, the lower chamber is still roughly two months away from voting on its next leader. Still, a number of groups with close ties to the Freedom Caucus have appeared to wipe clean any previous notions about Bonnen — and are now taking a more open-minded approach to him as the apparent next speaker. Another hardline conservative coalition, the North Texas-based NE Tarrant Tea Party, has a similar outlook. “It’s still going to be a long, challenging session,” the group wrote in a Nov. 15 Facebook post. “But at least it looks like Dennis Bonnen is prepared to negotiate in good faith with Dan Patrick. That's more than we can say about Dennis Bonnen's predecessor." And the head of Empower Texans, one of the state’s most deep-pocketed groups, said last week that Bonnen as the likely next speaker “gives conservatives cause for optimism” — just months after the group backed the state lawmaker’s primary challenger. During the March primaries, Empower Texans dumped over $100,000 into the race to support Damon Rambo, campaign finance reports show. Rambo, as the group described in January, was the “cowboy hat-wearing conservative activist” running against Bonnen, whose record, as Empower Texans wrote at the time, “has been a mixed bag at best and it’s been on the decline.” Rambo lost to Bonnen by more than 50 percentage points. Months later, as Bonnen began to surface as the frontrunner in the speaker’s race, the group took a softer approach. As Empower Texans CEO Michael Quinn Sullivan tweeted on Nov. 12, Bonnen’s strategy — by campaigning to secure a majority of House Republican support instead of winning over most House Democrats, as Straus had done in his first election — is “very reassuring” to Texas GOP activists. The next day, after Bonnen had announced the support he had in the speaker's race, Sullivan offered an explanation during a live Facebook broadcast for why the group had endorsed against him in the primaries.